Photography offers something for everyone. Whether you love gadgets and want the latest high-tech tools, or you need something lightweight and easy, you can be sure there are cameras and gear out there to match your needs. But with so many choices, how do you decide which is best for you? Here’s our camera buying guide to help. Cameras are generally divided into two main categories: Point-and-shoot and SLR. Point-and-shoot Cameras – For the most part, point-and-shoots are compact, lightweight, and easy to travel with. They almost always have zoom capabilities, and the lens is usually permanently attached. They’re true to the name you can turn the camera on, point and shoot without a whole lot more to worry about. All our phone cameras are essentially point-and-shoots. Mirrorless – Mirrorless cameras are like a hybrid between point-and-shoot and SLR. They have interchangeable lenses and often very high-quality sensors like large SLR cameras… but they’re more compact, like a point-and-shoot. Many amateurs and pros alike are now going with mirrorless cameras, as they lighten your load without sacrificing quality. The biggest (and probably most important) difference that distinguishes an SLR or mirrorless camera from a point-and-shoot lies in the quality of the pictures each is capable of making. While point-and-shoot cameras have their own advantages (they’re compact, easy to travel with, usually cheaper, and they auto-adjust almost everything to help you get the best picture possible), they cannot compete with SLRs and now mirrorless cameras in terms of image quality. That is because digital SLRs and some mirrorless cameras have much larger image sensors. This larger sensor size produces a much higher quality image and, therefore, the pictures you produce with an SLR will be saleable in many more markets than those taken with a point-and-shoot. There’s really no such thing as the “Ideal Kit,” no more than there is an ideal mate, or an ideal car. It’s all subjective, and it all depends on what your photography goals are. The best we can do in this camera buying guide is to point you in the right direction. While it’s always best to have at least one camera on you at all times, and most of us do with our smart phones these days, it’s likely you’ll want a different setup for each of the different kinds of shooting you’ll do. Most professional photographers own a compact point-and-shoot camera they can easily slip into their bag or carry in their pocket. Some will tell you they never leave home without it. All agree that a lower quality picture taken with a point-and-shoot is better than no picture at all. And sometimes, it’s just not prudent to carry your bigger equipment around. This is the first level of equipment you should have in your kit. At times, it’ll be the only equipment you carry. And yes, it can be your phone. There are currently many brands making excellent point-and-shoot cameras: Nikon, Canon, Fuji, Panasonic, Olympus, Sony and Pentax all have excellent offerings. When you’re buying a compact point-and-shoot, try to get one that has at least 12 megapixels. Megapixels aren’t all you should be thinking about, though, because not all megapixels are created equal. Twelve megapixels on a point-and-shoot camera isn’t the same as twelve megapixels on an SLR. Each of those pixels on the SLR will be several times larger in size than those on the point-and-shoot, which translates into higher image quality. These days, you shouldn’t consider anything less than 12 megapixels. Optical zoom. If your camera comes with “digital” zoom, turn it off. When you set your camera to use digital zoom, it’s only enlarging a very small part of an already small sensor. While it may look OK on the computer, it will not print well. Most cameras allow you to turn off the digital zoom setting. You should do that and ignore anything the salesman tells you about digital zoom. A good camera should have at least 3 x “optical” zoom. Many models offer up to and beyond 6x. The ability to shoot RAW files. In the past only the more expensive Digital SLRs were capable of shooting files in RAW format (this type of file stores the maximum amount of data) allowing for greater flexibility and quality in the final output using a computer program like Adobe Lightroom to “develop” it. Not all point and shoots have this capability. Consider it a plus. Image stabilization. This is a feature that greatly reduces camera shake giving you the ability to take shots at slower shutter speeds and lower light levels. Good viewscreen (or LCD) for shooting and image review. While most cameras in this size range rely on the LCD screen to compose the photograph, some also have an optical viewfinder. Because of the small size of the camera, these optical viewfinders are often too small to be of real use. Video capability. Most high-end point-and-shoots will do a great job of recording video, including sound. Digital point-and-shoots are capable of producing images that can be printed up to 8 inches by 10 inches — perfect for uploading to websites like Facebook, or for sending to friends over the Internet. Many digital point-and-shoot cameras are also capable of producing images that are high enough quality for use on websites, in newspapers, and in magazines, making them ideal for travel writers who would also like to shoot photos to go along with an article. There are some stock photographers in fact who have gotten so adept with their phone cameras that they are building stock portfolios almost exclusively with phone shots. The proliferation of the Smartphone camera has also resulted in camera manufacturers trying to compete by creating new compacts with much more to offer. These high-end pocket cameras offer things like the ability to shoot in RAW, faster lenses and larger sensors, all of which increase the image quality. What’s important is that you find something with at least 12 megapixels, and something new. Used point-and-shoot cameras can be fine, but technology changes so quickly these days that you don’t want to buy anything that’s more than a year old. 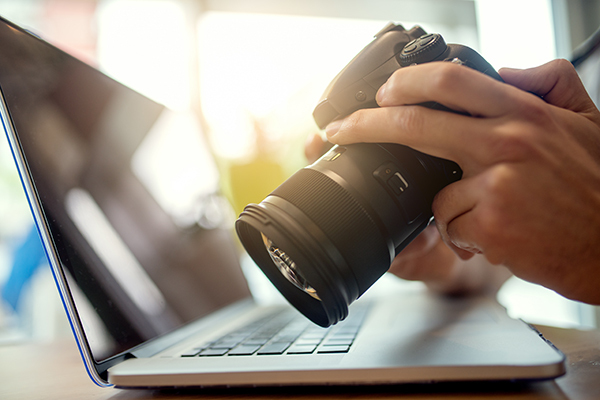 If you want a professional image to print in a large format — such as a fine art print that you can sell, or you’d like to submit images to a stock agency, you’ll want to consider a digital SLR camera. With point-and-shoot cameras, you’re limited to the zoom range that is fixed to the camera. But with a DSLR, there are literally hundreds of different lenses to choose from, giving you greater creative control. DSLRs have an image sensor that’s significantly larger than those of point-and-shoot cameras and can produce a much higher-quality image. So, when it comes to image quality, bigger is better. Camera makers have led us to believe that a camera with more megapixels is always a better camera. But as we mentioned earlier, the size of the sensor is a very important part of the quality equation. Understand that a 12-megapixel SLR will always outperform a 12-megapixel point-and-shoot in image quality. Which is why we wrote this camera buying guide. With DSLR cameras, higher price means greater durability, including great water resistance on the highest models, and much faster focus response time. The best DSLR cameras also give you noise-free images at higher ISOs for better low-light shooting. Image stabilization is a common feature here. Some manufacturers build it into individual lenses (Nikon, Canon, Panasonic) while others build it into the body and any lens benefits from the image stabilization (Olympus, for example). Video is now expected on most DSLRs. The ability to plug in a wireless microphone can make a significant difference in your sound quality. If you’re interested in video, this is a worthwhile feature. Entry level DSLRs do a fine job in most conditions, but if you’re going to be shooting sports or action wildlife, you’ll want to move up in price to take advantage of the faster autofocus and multiple frames per second these models provide. Should you get a bigger DSLR camera, or a smaller mirrorless camera? DSLR cameras still have some quality and speed advantages, and their batteries last a lot longer. With mirrorless cameras, you “see” the image through an LCD screen, so they eat up batteries fast. But as far as disadvantages, that’s really it. The image quality these days is so good that you could skip getting a DSLR altogether and go straight for a mirrorless camera. In fact, many pros are abandoning their larger systems for a high-end mirrorless one. Most professional photographers will tell you that their preferences in camera brands are largely dependent on how the camera feels and handles, not just on how many pixels or settings it has. It’s very important to physically handle multiple cameras before you buy. It isn’t enough to Google all the reviews and make your decision based on Internet statistics. A camera is like a pair of jeans. You’ve got to try it on before you buy and make sure it fits. Is it too heavy? Are the most common functions — changing your aperture, shutter speed, ISO, and exposure compensation — easily manipulated on the body of the camera without having to search through the menus on the LCD screen? The major players in digital SLR photography today are Canon, Nikon, Pentax and Sony, with Canon and Nikon in the lead and Sony quickly catching up. For mirrorless cameras, the leaders are Sony, Fuji, Olympus and Panasonic. The major advantage to sticking with these brands is that they’ve been at this for a long time. They’re not likely to go out of business (leaving you with a bunch of equipment you can’t sell off, upgrade, or repair). They also have higher resale value. And if you stick with Canon or Nikon for SLR cameras, you’ll have a large selection of accessories to choose from — both name brand, and aftermarket. The rest comes down to price. Nikon D3400 – With a great sensor, 24 megapixels, and video capability, this camera packs in a lot for the lower price tag. At under $500, you can get both the camera and an 18-55 “kit” lens at B&H Photo. Canon Rebel T6 – Canon’s Rebel series is a great place to start, with several different camera bodies starting at a low and ending at a moderate price point. The T6 with an 18-55 lens is similar to the Nikon entry-level DSLR above, and also less than $500 at B&H. Canon 5D Mark IV – This is one of the most popular cameras among professional photographers, for good reason. It’s a solid workhorse, with 30 megapixels, great video capabilities, and all of speed, bells and whistles of a professional camera. You can get one – without a lens – for about $3,000. Nikon D850 – This is a high-end professional SLR from Nikon that more or less matches the Canon 5D, above. At 45 megapixels, it also has fantastic video recording capabilities, and all the same bells and whistles as its Canon counterparts. Also around $3,000. You can spend even more, if your budget allows. At the present time the Nikon D5 and Canon 1Dx Mark II are representative of the top of the line with the body alone (no lens) costing around $6,000. However, the mid-priced and entry level models will provide image quality that lets you enter any market. Panasonic Lumix DMC-G85 – At under $900 with a lens and an accessory kit, this camera is part of Panasonic’s popular “Lumix” series, which range in price and quality. Panasonic has developed a lot of smart features to help you get your exposure right, and even sort of pre-process your photos in-camera. Olympus OM-D E-M10 Mark III – Olympus is known for their excellent lenses and has quickly become one of the top players in the mirrorless camera game. They also smartly include the image stabilization in the camera, instead of the lens, producing sharp images. This particular camera is beginner-friendly and fun to use, and comes in at under $700 with a 14-42mm lens. Fujifilm X-T2 – One of the best-selling cameras in the mirrorless world, Fuji’s X-T2 produces high-quality images and fantastic video… and it’s a lot of fun to use. With many of the controls on the outside of the camera, it’s a lot easier to find and change settings than with many other brands. With a (really good!) 18-55mm lens, this will run you about $1,500. Olympus OM-D E-M1 Mark II – The higher-end option in the Olympus world, this is a cult favorite among Olympus shooters, who love the ease of use and the fantastic image quality. At 20 megapixels, this camera will perform like a professional DSLR without the weight! You can get it with the kit lens for around $2,500. Sony Alpha A7r III – This is the top-rated and top-selling mirrorless camera on the market. At about $3,000 (body only, no lens), it’s probably the best, in terms of quality. But we don’t recommend it first, because Sony cameras can be a pain to use. Many of the settings are buried in menus and they can be frustrating to use. If you’re a very technically-inclined person, this might be the camera for you. If not, we recommend you try it out before investing to make sure it won’t drive you crazy! In general, your lenses will last significantly longer than your camera body. When you upgrade your camera, you can use your lenses from the same manufacturer… so they’re often worth the investment. Nikon prides itself in the fact that every lens it has made will still fit on the newest bodies. The really old ones may not auto focus or auto aperture, but the lens is still usable. When you’re buying a camera in the store, your salesman will more or less tell you what you’re getting. But when you buy online, make sure you double-check to see whether or not your camera comes with a lens. Usually, the description will tell you. Or it’ll say “camera kit” which implies you’ll get both the camera body and a lens. Most starter cameras come with an 18-55mm lens. This will serve you well on the street and at family picnics. Most photographers, however, want something with a little more range for photographing things farther away and/or a faster lens for photographing things in low light. Sports photographers need telephotos in the 200-400mm range. Landscape photographers use telephotos and wide angles, sometimes as short as 17mm or so. And food photographers likely want a “fast” lens (more on that in a minute). This may be a camera buying guide, but lenses are equally, if not more, important as your main camera body. Quality lenses make a noticeable improvement in your pictures, so it’s far better to buy a quality used lens than a cheap knock-off of a no-name brand. A high-quality lens can last your entire photographic career, even when you upgrade camera bodies — as long as you stay with the same brand. B&H Photo (www.bhphotovideo.com) and Adorama (www.adorama.com) are reputable sites for buying and selling both new and used camera equipment. If you don’t know what you want, start with the lens that comes with your camera and work your way through the ones listed above. Lenses are generally classified by their focal length and their maximum aperture. A 28-135mm f3.5-5.6 zoom lens has a lens focal length between 28 and 135mm and a maximum aperture of f.3.5 – f5.6, depending on how far you extend the telephoto (zoom). Aperture is like the pupil of your eye. The more you open up your aperture, the more light you let into your camera. And, conversely, the more you close it, the less light you let in. And aperture is measured in f-stops. F-1.0 is a very wide (often referred to as “fast”) aperture setting — the most light your lens can let in. And f-22 is very small — the least amount of light you can let in. So, with a 28-135mm f3.5- f5.6 lens, the widest you can open the aperture is f3.5. And that is at the 18mm wide angle setting. When you zoom to 135mm, the widest aperture becomes f5.6. If your camera needs more light to hit the digital sensor in order to make a correctly exposed image, and it can’t open up your lens to get the light it needs, it has no choice but to adjust your shutter speed. So, that’s why many photographers often want a “fast” lens. That is, a lens that’ll let you open the aperture in the range of f2.8 or less so that your shutter speed can stay fast in a dimly lit environment, like a night club or restaurant. A wider aperture also gives you a much shallower depth of focus. That’s how you see those lovely blurred backgrounds on many photos. Do you need a fast lens? Not everyone does. Travel photographers might not care about speed as much as they do zoom length. But it’s something to consider when you’re adding lenses to your toolkit. Most likely, the first lens you buy will be a 24-70mm f2.8 lens. It’s still considered fast, and it also has a nice telephoto. And, if you can’t decide which lens is best for you, start with the lens that comes in your camera kit. You can always trade up later. Which is Right for You: Point-and-Shoot, Mirrorless, or DSLR? Besides that, almost all of the techniques in our e-letter archives and our Turn Your Pictures into Cash Program can be practiced on a point-and-shoot and your Smartphone. Selective focus will be an exception. Other than that, their main drawback is when it comes to selling your work. While there are some exceptions, they still generally don’t produce images of a high enough quality for stock agencies, fine art, and some publications. DSLRs may seem more complicated, but they all have the same kind of completely automatic functions that point-and-shoots are famous for. You can take great photos shooting on full auto, and still have the flexibility available to progress as your knowledge increases. The higher image quality of photographs from an SLR means you can sell to practically any market you may be interested in. Which brings us to where you can sell your photos. Fine art for pieces 8 x 10 and smaller. If you want to publish your pictures both on the web and in print, what you need to know, is that while everything looks great on your computer, that doesn’t mean it will look great when printed in a magazine or as fine art. The computer screen displays everything at a smaller resolution, while prints on paper generally require 300 dpi (dots per inch) to make a quality reproduction. That means an image measuring 1050 x 1500 pixels will display on your computer screen as 15 inches x 21 inches (1050/72 = 15 by 1500/72 = 21). But that same image printed on paper at 300 dpi will only print to 3.5 inches x 5 inches (1050/300 = 3.5 by 1500/300 = 5). If you try to print it at 15 x 21, like it appears on your computer screen, you’ll stretch the image and it’ll appear blurry and pixilated. Just when you’re ready to make that shot of a lifetime, there is nothing more frustrating than running out of space on a memory card or having your battery die. So, always carry extra memory cards and an extra battery – or, if you buy a mirrorless camera, at least 2 extra batteries. If you tend to shoot a lot of photos, start the day with a large memory card in your camera and carry at least one more in a card wallet that fits in your pocket along with an extra battery. If you want to shoot in low-light situations or make high-quality landscape images, you’ll need a tripod and a shutter release. A shutter release sets off your camera without you having to touch it… thus preventing the camera shake that comes from pressing the shutter button when you’re making longer exposures. Today, most shutter releases are a camera accessory made by the camera’s manufacturer, so you have to buy them at a camera store or by mail order. There are all kinds of tripods on the market — some of which don’t provide much stability for your camera. Weight – The tripod should be heavy enough to support your camera and lens. Check to see if the tripod has a rating for how much weight it will be able to carry. You don’t want to put a DSLR on a tripod that is rated for a point-and-shoot, and you most likely won’t need a tripod that is rated for 25 pounds. Legs – Next, look at how the legs are extended and secured. Can you easily loosen and tighten the legs and ensure that they will not slip or collapse? Most tripods have a center column. Don’t use it, because the camera is most stable when the center column is not extended. Height – Finally, the tripod, when extended, should place the camera viewfinder at your eye level when you are standing. You should not have to bend over to look through the viewfinder. You will really like this feature when you are waiting for the perfect sunset and constantly checking things through the viewfinder. Bottom line: Take your time and you’ll find the equipment that best suits your needs. While there is a plethora of different camera equipment available on the market, hopefully this report has broken things down in a way that makes it easy for you to discern the main advantages and disadvantages of each option, so you can buy the right camera for you. Ultimately, what you plan to do with your pictures and where you plan to sell them will be the deciding factor for which particular brand and model of camera you buy. Remember, too, that your most important tool as a photographer isn’t your camera. It’s your eyes. As you become more advanced in your photography, you’ll learn to see things differently from the average person: the details/angles/lighting/etc. The key isn’t just purchasing the right equipment; it’s being able to develop a photographer’s eye. Practice with your new equipment and you’ll improve your overall sense of the craft, how well you see things, and the quality of your photos. Join us on one of our photography expeditions and learn to see the world through your lens. I hope this camera buying guide will help you find the right camera! For more, you can check out travel photography tips and hints from our seasoned photographers.